We are excited that Janet from My Cards For You is showcasing a cartridge for you. Janet is so talented as you are about to see. Hi everyone. 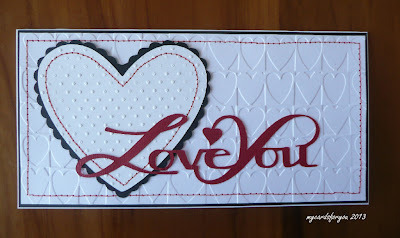 This week's Monday Cartridge Showcase at My Paper Crafting.com features the Lyrical Letters Cartridge. I have bought the cartridge as a digital one through the Cricut Craft Room, which makes it very easy to cut from as you don't need to insert the cartridge in the machine! It is also available right after purchase in the CCR, so you don't need to wait for it to be posted! What I really like about this cartirdge is the fact that there are seven different fonts to choose from, each of which has a capital option as well as lower case. There is a variety of shapes and words available on the cartridge, which again, makes it a very versatile one to have. I have made 5 different projects to showcase the versatility of the cartridge, and those of you who follow my blog, know that I am not really into scrapbooking much, but I have even done a layout for you to see as well! 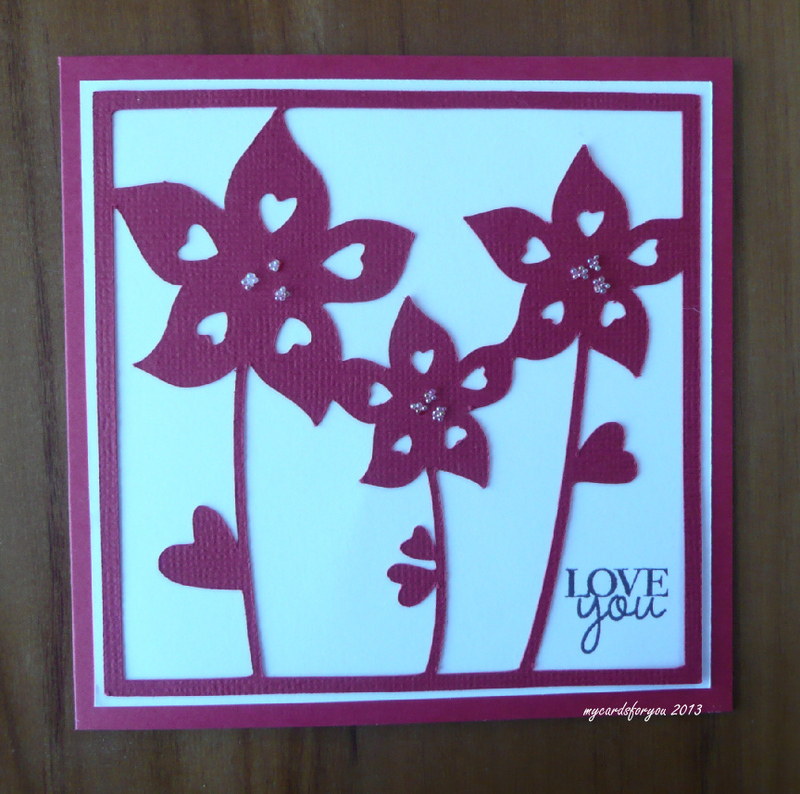 This is a simple Valentine Card that is cut right from the cartridge. I used the Connected font selection and cut the frame at 4". The flowers are part of the frame so it cuts as one piece. I added some clear beads to the centres of the flowers using Glossy Accents. The stamp is from a Hero Arts words set that I use quite a lot! For this card, I used the Connected font again and cut the sentiment at about 5" wide. 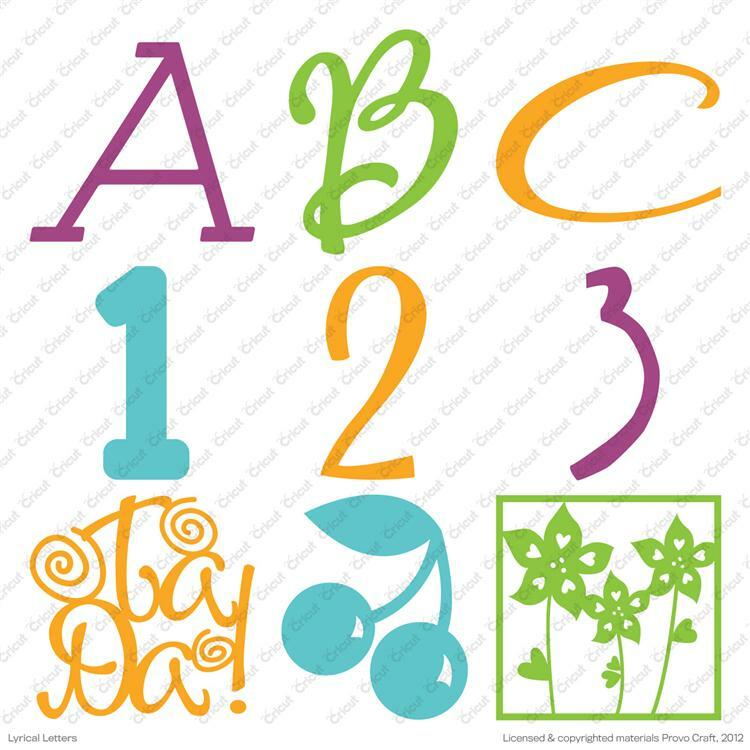 The heart and layers were cut from the Craft Room Basic font selection. I embossed the top heart layer then stitched around it with the sewing machine. I did the same with the layer on the card before adding it to a black card, then onto a white base card cut to fit. 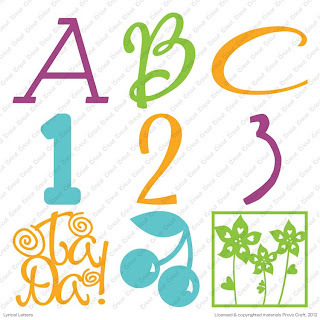 For my scrapbook layout, I used the Spring word from the Baisc font on the Lyrical Letters cartridge and cut the leaf and flower in different colours. The leaf borders were cut from the Jack Sprat shift/lock font. I added some stamped leaves and a journalling block with peeled paint distress ink and added a little picket fence distress marker to the stamped images to highlight them a little. I also added faux stitching to the lettering with a white ink pen. 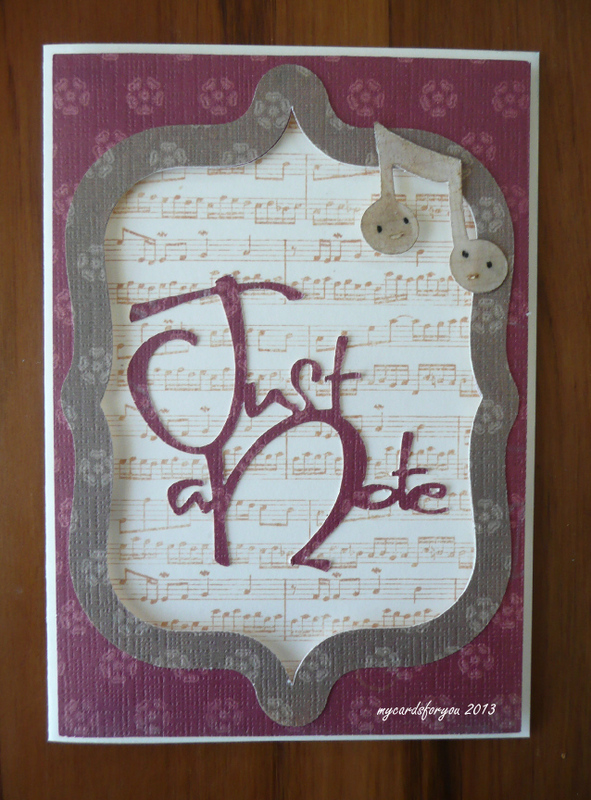 For the Just a Note card, I cut the frames from the Italic Monoline font, the notes and sentiment from Capital font. I stamped a music background using a Gina K music stamp in Tea Dye distress ink then layered it underneath the frame. 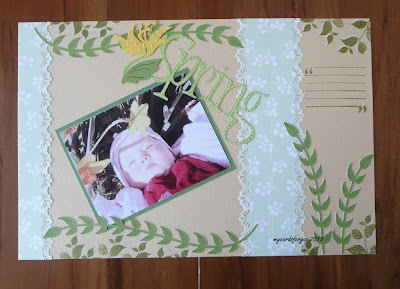 The frame is raised from the card using foam dots to give a little depth. The music notes were coloured a little with Walnut Stain distress ink then coated with Glossy accents and attached to the frame. The final card was made using the LoopDeeLoo font. I added the letters separately then welded them together before cutting them out. The layers on the card were cut using CCR Basic. I stitched around the top layers with the sewing machine and added some flowers, a diecut leaf and some pearl bling to finish it off. Hope you have enjoyed looking at this showcase using the Lyrical Letters cartridge and that it inspires you to get it or to use it if you already have it! Was that not just a fabulous showcase!! 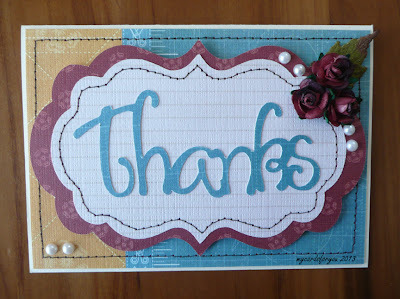 Thank you Janet for the wonderful projects and great inspiration. If you have not already visited Janet's blog, you can do so HERE. Have a great week and come back to visit us here daily. There is always something new and exciting. Ooo, I like this cart. I might look into getting it. I can always use a new alphabet cart :) All projects made turned out great..so pretty! Great showcase, Janet! I'm going to have to dust that cart off and give it another look! Wow thanks for a reminder of what great fonts Lyrical Letters has on it. You rocked another showcase out. I love them all but the heart one with the embossing and the baby layout are my fave. Thanks for great inspiration. Wow Janet you did an awesome job of showcasing this cartridge! Each project shows how great this cartridge really is! I loved each and every one! !